Making a connection with someone who has been through similar experiences is invaluable. 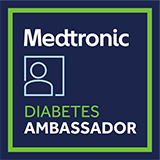 Ambassadors can discuss their real experiences and help you have a better understanding of what life is like on an insulin pump and/or CGM. Thank You for Making a Connection! You’ve sent an email to an Ambassador. Please expect a response within 48 hours. If you do not receive a response, please email ambassador@medtronic.com and we will follow up to ensure your questions are answered in a timely manner. You have exceeded the limit of 3 requests per day. Please try again later.